A while back I posted about Shutterfly using one of my books to make a video. You can see that post here. As I explained, Shutterfly made the video, but decided it showed too much about how they do business, so it has not been posted to their site and YouTube as they had planned. 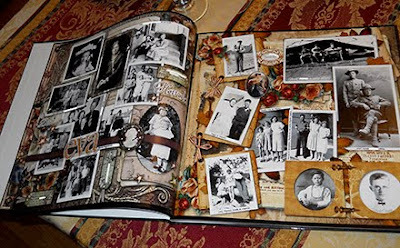 I've been asked to see my book for ideas in making an ancestry book. Out of respect for Shutterfly, I have not posted my copy of the video here, but I will share a few photos of the book. 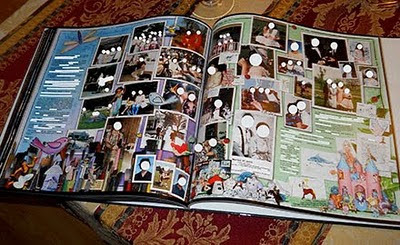 I have removed faces, names, dates and places from the pictures to protect people from identity theft. 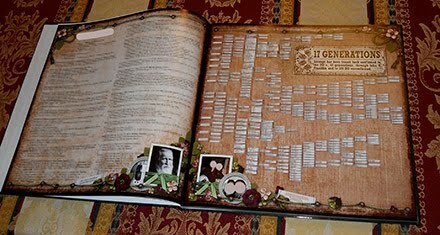 Sadly it ruins the beauty of the book, but what better place for a criminal to get enough information to do this dastardly thing than an ancestry book full of names, places, dates, family relations...it's all right there. And once we put an image up on the net, it's there for anyone - forever. 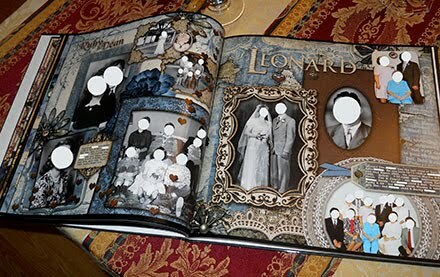 So, here are some things I did with my ancestry book that you might like to do for your project. Having a plan of attack makes this monumental project more manageable. 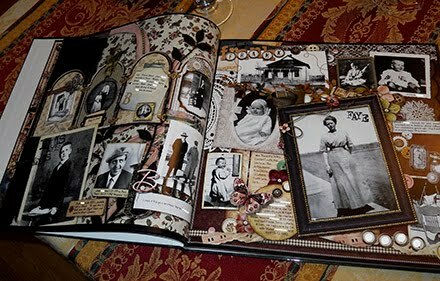 Collect all the pictures of ancestors that you can. Enlist family members in the detective work. This can even be a wonderful way to re-connect with those you have lost touch with. With pencil, softly write names, dates and places on back as you discover information. I say pencil so that it could be removed and changed without damage and "softly" so no indentation is left on the image side. Put them in chronological order as best you can. I got a small box and made dividers for the years to separate the photos and filed the photos in the box. 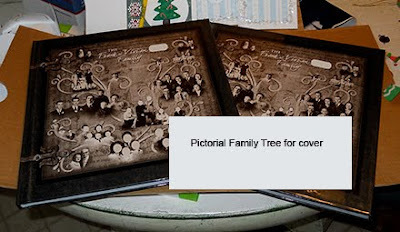 At this point I started diagramming a pedigree chart with how I thought people in the pictures went together. If you are blessed like I was, you will find family members older than yourself who can help greatly with this. After 8 years of working on my book, my oldest half-sister joined Ancestry.com and researched the family lines both through our father and my mother. This was WONDERFUL and oh how I wish I'd had that information to start with...and for my children's father who I had to try to unravel alone - by hand. I am so grateful they generously gave me every picture and piece of information they had, but oh did I find out I hate doing that part! 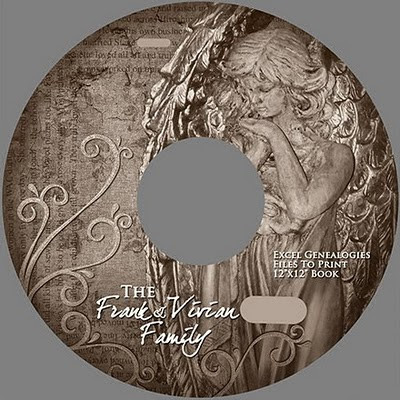 :) To thank them I gave them the digital results, scans, restorations, charts, the whole bit so that any family member who wanted their own copy of everything could download the entire thing. 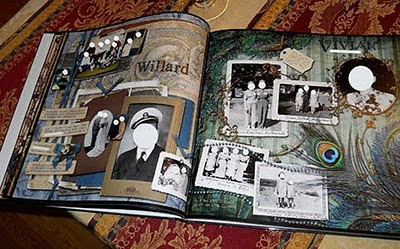 When I found letters, newspaper clippings, postcards or paper memories, I scanned them, indicating their details in the file name. When I had belongings of ancestors (military metals, favorite belongings that had been handed down, etc.) I took photos and extracted the items, again noting their details in the file names. This page shows my father's actual medals, pins, dog tags and foot locker along with small images of actual recruiting posters. The background has President Roosevelt signing the peace accord blended into it and there is a picture of the bomb going off as Daddy walked over Hiroshima a month after it happened. When I had the photos in order, I scanned each one, noting their details in the file names and storing the scans in folders for the years, inside the parent folder for the ancestry book. Then I started restoring each image in PhotoShop. I found the oldest damaged pictures to be eminently easier to restore to a wonderful state than the pictures I so carefully took, chronicled and stored of my own children. It's heartbreaking the condition they are in. 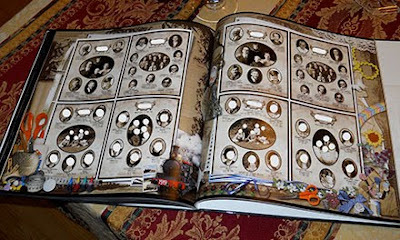 I also included as much of each family that joined to our lines by marriage as I could find pictures of. In the mean time I collected digital freebies of antique items that I could use on pages to give some feel for what life would have been like for the people of that era in the photos. I prefer 2-page layouts, but since I had chosen to make colors and elements reflect the era of the page, matching pages was not going to happen, so I decided to make each page distinctly different. Each page is a design that stands alone. Sadly, the most pages I could publish were 101. It was my goal to use every photo from before my graduation from high school (and I did), so that everyone would have every picture. That didn't leave room for stories. I was able to include names, dates, locations, military records for both my parents and a little more, but not nearly as much as I wished. To make up a little for not being able to fit stories into the book, when I designed the covers I included text running around front and back in concentric squares that told brief facts about some people. I blended it into the design so it doesn't jump out at you, but it can be read. Another thing that was important for me was to leave blank pages at the end of the book so that my daughters could hybrid scrap their lives as they marry and have their own families and maybe even those after them, to keep the book growing. In the past I had designed a page that would display a picture of a man, the woman he married, a picture of the family they had in the center and then below, individual pictures of each child. I put a plaque in the center top with the family last name in it and included full names, birth and death dates and the couple's marriage date. I had made one for each of my parent's families of origin, then when they married and had myself and siblings then one for each of us children and our families. I did this for my husband's family also. 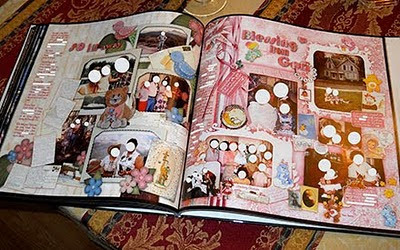 When I was making the book, I shrunk those pages to fit four to a page and included them in the back of the book just before the blank pages which are only pretty backgrounds that will be added to by my daughters (or nieces and nephews who have a copy as the book is their family also with the exception of the part that is my daughter's father's family). 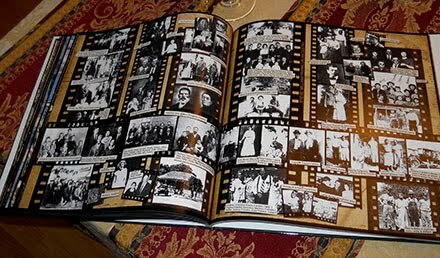 I made all those pages sepia so that attention was on the faces and not on the fact that some where black and white and some where in color. 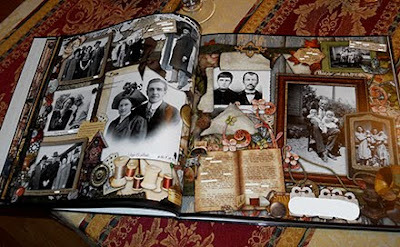 All the elements on these pages reflect the interests and professions of the contemporary family. I included lots of extractions from pictures of our lives. The first two pages of the book reflect the pedigree chart. On the left is a written history including locations. I had this done with all the information I had found before I received the Ancestry.com information. The right hand page is as much of the pedigree chart itself as I could fit on a 12x12" page and still be readable (possibly with a magnifying glass). My sister had successfully traced our father's mother's line back to 300 BC (????) when I printed the book. 49 generations. 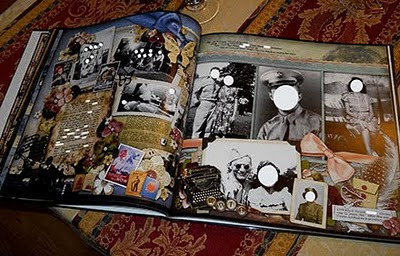 I was able to show only 17 generations on my page, but it's everything in that time frame for every, yes I said EVERY, person connected that I had come up with. I wanted to give context to the "time". So I did a lot of world history/American history research on-line. The way I ended up doing it was to create my pedigree chart in PhotoShop and behind it I put vertical stripes. Within each narrow stripe I typed as many of the significant events of that year as I could (so they would show around the chart entries). I didn't want that to be the focus, so it's done faded into the background. With variances we experience with publishers, I wish now I had made it a bit less faint, but it still works. (Are you starting to see why this was 8 years in the making? And for about 5 of those years it was almost all I did.) The colors in the right page look wonky here due to the lighting, but in reality they match the left page. 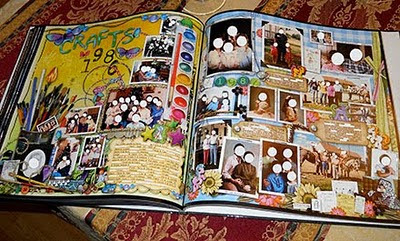 The photos on the left page are the oldest two I have and on the right page are my daughters who the book was primarily made for. I had thought to do the book completely chronologically, but when I was in progress I found that I needed to separate my father's line and my mother's line until they joined. Since Daddy was older and the family name, I began with his oldest ancestor that I had a photo of and worked my way up till they met. Then I started with Mom's oldest ancestor and did the same. I prominently marked the first page with each family line with the family name. Here again I found that strictly chronologically was not by best use of space once I reached my grandparent's families. I had more pictures then. 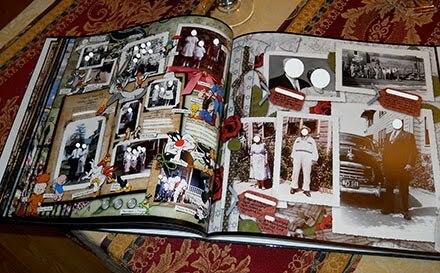 After I brought the line of the spouse who married into the family in, then I made a page for each of the offspring - all pictures of them on one page each, prominently marked with their name. I kept this pattern throughout the book. After the point in history where my parents married, then as extended family pictures were available, they were added to that period of time with our family. Major family reunions had pages all of their own due to the number of pictures, but always in the correct order chronologically. The page on the left below was fun as I added all our favorite cartoon characters from when we were growing up. Each page includes items from that era of American history to indicate what life was like for those people, extracted photos of things they wrote or owned when possible, things to reflect what they did for a living and colors appropriate for the era. 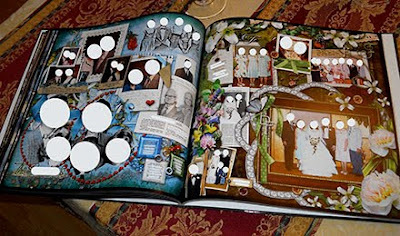 As the pages move to current photos the pages are bright and current. Personally, I am a chronicler/historian/journalist. If it's not true I have no use for it (except in entertainment). This was to be a completely honest and accurate record of family history for my daughters, nieces and nephews and those to come after them, all beautifully restored, in order, with as much information as possible - all in one wonderful volume that everyone could have for themselves! No anonymous shoebox of photos only one can have. As I said, I didn't have room for stories, so I am referring only to the actual pedigree progression. It wasn't to be about people's vanities. 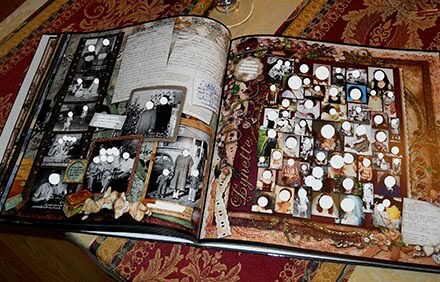 I included my mother's first marriage before she met Daddy and pictures that I had. 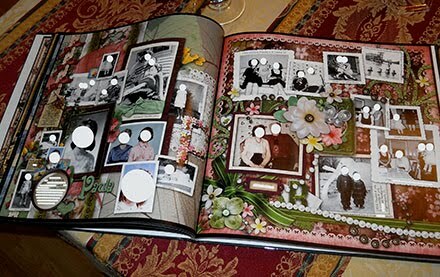 I included Daddy's first marriage to my half-sister's mother before he met Mom and pictures that she happily supplied. I included the name, birth and death date of my sister Paula's twin brother Terry. He lived, if only three days. He was family. Why wouldn't you? I included both my marriages to men who left me as well as my current husband. These are facts, not someone's vanity. I was very sad when I was told I could not include several marriages, names and pictures. My life's work is no longer accurate and that was so important to me that I didn't even spare my own feelings. But it is what it is. 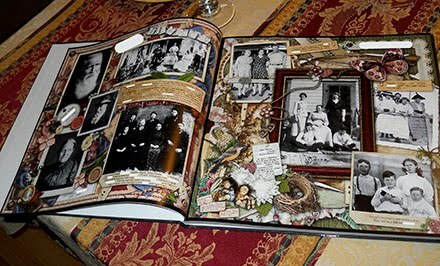 Prepare yourself for possible strife to arise from this effort of love and service you do in making an ancestry book for family. 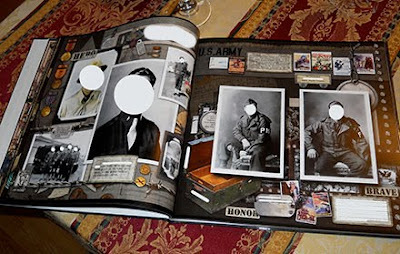 I wanted each family member to be able to reproduce the book for posterity and to have access to both the restored images and the original scans, as we are constantly learning to restore better. I also included the entire pedigree chart as it stood at the time of publishing (my sister has found even more relatives to date). I burned all this to cds and printed labels matching my cover. One cd of everything one would need to publish the book and the other cd of everything else. I glued the cd sleeves to the inner back of each book to store the cds so they would never be lost. 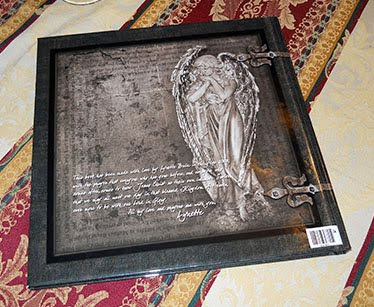 Another benefit is that anyone can now view the book and the individual images on their computer or on many TVs. Tip: I use all the page and cover images from my very fist book, Surrounded By God's Glory, a book of photographs I took of our garden coupled with lessons God has taught me in that "special" way, as a slideshow screensaver and oh do I love it! 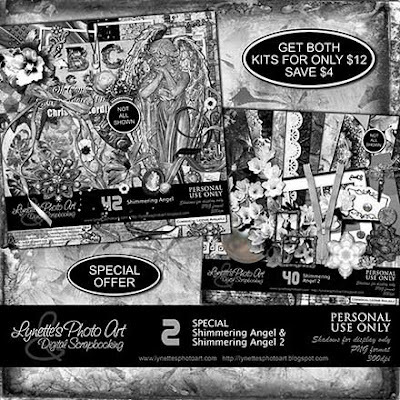 In case you are wondering, the wonderful angel from the back cover and CD label is available separately in my Shimmering Angels Kit and also bundled with Shimmering Angels 2 here. Realize that the self-publishing industry has limitations that the books you buy in stores don't. Design your pages and covers with empty space around all four sides, (empty of important things but still has background), as cropping inconsistencies will make you very unhappy otherwise. Know that colors have much more chance of being very different in the finished product than they have of matching what you designed on your monitor. My pages have much less trouble this way than my covers, which often are a real disappointment. Keep your spine design plain. 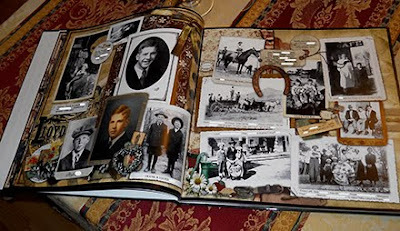 On my Ancestry Book I designed the cover to be worn old leather that was bound by marvelously rusty hinges on front and back, connected by a metal band around the spine. I'm here to tell you that no matter how perfect it is in PS and using the publisher's own templates, not once have they been able to print this book correctly and line the front, back and spine up properly for this design - even working closely with customer service. Save yourself grief and keep the spine plain, that is to say, don't wrap things around the book because they won't line up properly. Be aware that in a 101 page book, designs printed near the binding edge of the page disappear into the "crease". Again, keep important things away from the edges of the page. I hope this helps! It's a marvelous ability we have today that allows ordinary people like us to do this. Just astounding! Enjoy! Thank you so much for taking the time to tell how you went about making this wonderful treasure. 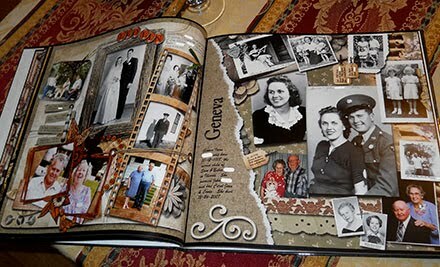 I am so impressed with all the work you have done and it looks great - a true family keepsake. It is very impressive. Oh, my goodness! What a wonderful labour of love! I'm sure everyone is thrilled with the book. Love the pages, & thank you for all the pointers. I'll be doing something similar some day. Blessings!